I know I've referred on and off to the monster movie books of my youth, and how it took a long time to get around to finding a lot of the movie I read about, but one of the images that really stuck with me was the fearsome face of Christopher Lee in full-on-rage-bomb Dracula mode from Horror of Dracula (1958). I mean... come on... I was four. As a kid I somehow got that there were the creepy/ eerie Universal pictures and then there'd been a second wave of remakes - and those remakes looked terrifying as hell to my young eyes, so - thanks but no thanks. Sometimes I'll make fun of Hammer sets for being curiously well-lit vampire environs Pretty clearly Hammer was not going to shoot in either the German Impressionistic style and they were going to give themselves plenty of coverage, lighting wise, so they didn't need to worry too much about shadows so they could just get through their shoot. Plus, you know, if you made this period-appropriate set, why not show it off? So when you go tromping into Hammer films, you're more dependent on character and ideas than what you can't see, the unknown and what lurks in shadows. This is the second (maybe third?) 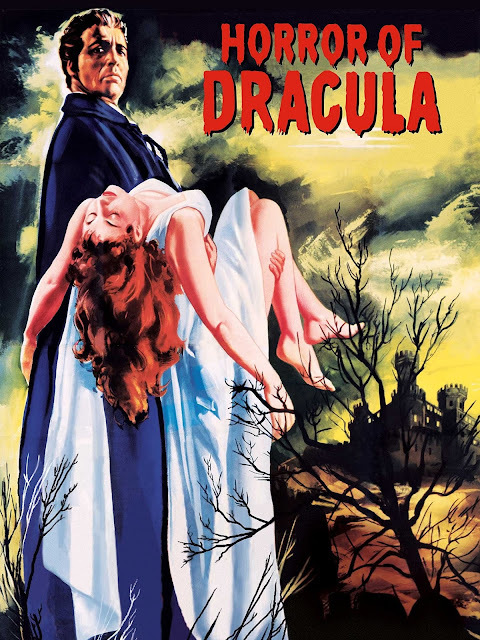 time I've watched Horror of Dracula (1958) and probably the first time I've watched it with intent to see what they're up to rather than just taking it in. 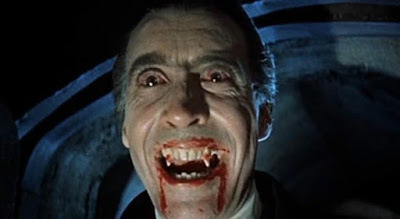 First - Peter Cushing as Van Helsing and Christopher Lee as our count are @#$%ing PHENOMENAL. Anyone playing Van Helsing going forward (and there's usually 4 or five people in movies and TV per year who will) needs to watch Cushing's performance to see what a hell-bent vampire killer looks like in practice. And, unlike Lugosi's Dracula, who is all trickery and mind-@#$%ery, Lee's Dracula is arrogant evil, a colossus of horror. He doesn't speak much, and when he does... well, he's Christopher Lee. Second - the movie is truer to the book than I'd remembered. I mean, it's still a country mile from the source material, but they keep Mina and Lucy in their respective roles, and there's the horror of what's happening with Lucy. The rest is mostly made-up to accommodate fewer actors and sub-plots, even if some of the changes don't make a ton of sense. Van Helsing is a man of science trying to penetrate the world of shadows and folklore with reason, even as his scientific conclusions are "oh, yeah, beings of pure evil. We must smite them.". Watching Michael Gough (Batman '89's Alfred) go about his business is also pretty great - his reactions, frustrating as they are as an audience who is fully on Van Helsing's side, do give perspective to what happens when you're skeptical of the resident vampire hunter and how having your sister turned into the undead is a total bummer. The women of the film play their roles, even if written a bit flat. Carol Marsh as Lucy is given by far the most to do, and she's... fine. Her transformation to the monstrous undead gives her the most interesting stuff to work with, and she rides the line between eerie and familiar well. As much as I think Hammer films just fifteen years later look retro for their time, these movies, despite the budgetary concerns and play-like workings feel like a necessary quantum leap from the latter-era Universal pictures (minus Creature from the Black Lagoon) and poverty-row horror flicks of the atomic era in America. The movie feel personal and intimate in their scares more than "oh, hell, a giant ant" - which, you know, I'll always have love for, but it's a different kind of thrill. When Hammer is on, they're on - and this film certainly helped to cement their reputation. Director Terence Fischer does a lot with not much, and he wound up making a movie different from and as near-iconic as Universal's Dracula. While I still enjoy the Universal pics for any number of reasons, there's more than enough room for Lee as Dracula and Cushing as Van Helsing in your monster portfolio.